In the bottom-left corner of the Mission Control System Preferences pane in OS X El Capitan is a Hot Corners button, which lets you designate any or all of the corners of your screen as hot spots to trigger Mission Control, Dashboard, Launchpad, Screen Saver, or Display Sleep. Click the menu for a corner, and select the feature you want associated with that corner. Then, whenever you move your pointer onto that corner and leave it there for a second or two, the feature executes. Hot corners have been part of Mac OS since time immemorial and are still as useful as ever. Set the top-right corner to start your screen saver and the bottom-right corner to disable it, for example. 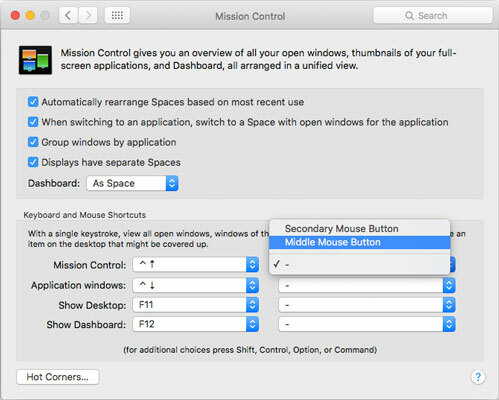 Mission Control is enabled by default, but you can disable any or all of its features by turning off its trigger: Just choose the minus sign from a pop-up menu instead of a keyboard or mouse-button shortcut. Here, the Mission Control mouse trigger is currently disabled, but it’s being changed to the Middle Mouse Button. The Mission Control System Preferences pane with Hot Corners . . . on the bottom left.